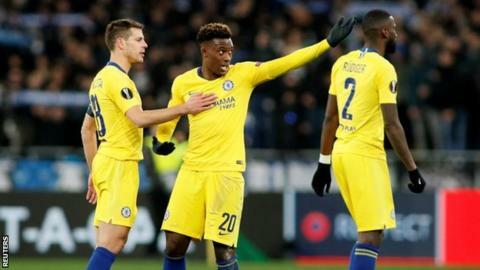 Uefa is investigating an alleged case of racist abuse towards Callum Hudson-Odoi during Chelsea's Europa League win at Dynamo Kiev on 14 March. If European football's governing body finds "sufficient evidence" it will "open disciplinary proceedings". If Uefa finds a club guilty of racism, it can be punished with "a minimum of a partial stadium closure". Subsequent offences are punished with more than one match behind closed doors, a stadium closure, the forfeiting of a match, the deduction of points and/or disqualification from the competition. Dynamo Kiev have twice been punished for racist behaviour, after games against Everton in March 2015 and Chelsea in October 2015. They were forced to close part of their stadium after the Europa League tie against Everton, while they served a full stadium closure after the Champions League group game against Chelsea, which they drew 0-0. Hudson-Odoi was also part of the England team, which beat Montenegro 5-1 on Monday night and was subjected to racist abuse from fans. Uefa has charged Montenegro with racist behaviour, with the case dealt with on 16 May. Hudson-Odoi, who made his full England debut, said he and team-mate Danny Rose had heard "unacceptable" monkey noises from the home crowd.